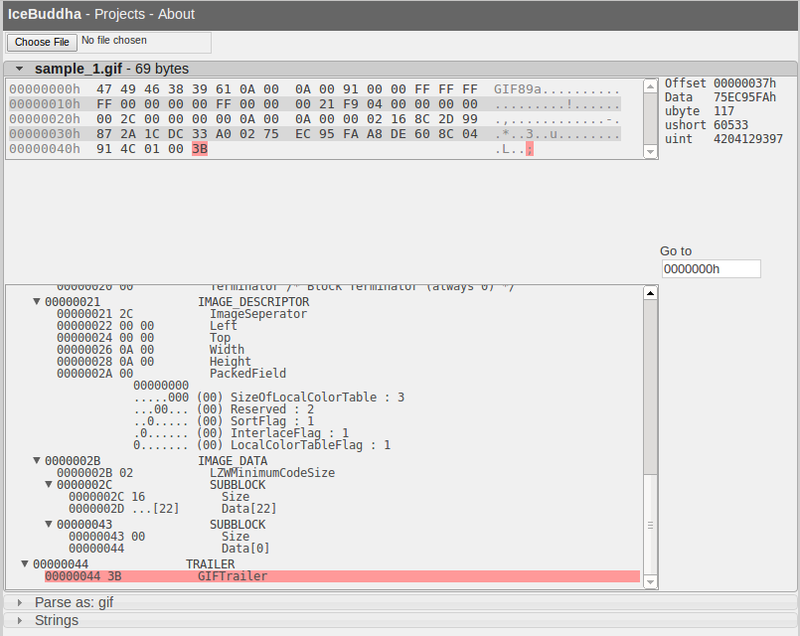 This post is a tutorial on how to use IceBuddha and it's parse scripts in performing some malware analysis on Mini Duke. 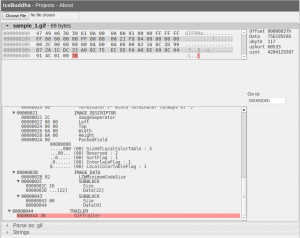 On February 27, 2013, Kaspersky Labs released a paper The MiniDuke Mystery: PDF 0-day Government Spy Assembler 0x29A Micro Backdoor. The paper states that the Mini Duke PDF exploit connects to artas[dot]org/engine/index.php (and some other domains) where it downloads a gif file that contains an encrypted backdoor. 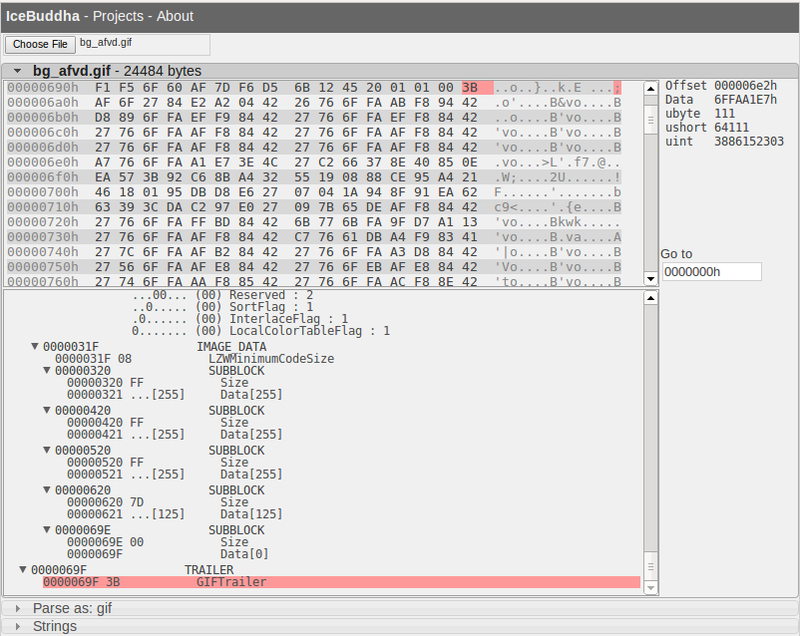 I grabbed a copy of one of the files (bg_afvd.gif: md5sum 92a2c993b7a1849f11e8a95defacd2f7). I put the file in a password protected zip, using the same password scheme as http://contagiodump.blogspot.com, and you can download it here: bg_afvd.gif.zip (md5sum: 39664ffaf93d8961d1498de8a7c49807). It's just a normal .gif file with some data appended to the end, so it can't infect you, but it's always good to take precautions. This sample file is the same one used by http://www.matthewflickinger.com/lab/whatsinagif/bits_and_bytes.asp which is an excellent explanation of the GIF file format. When I look at bg_afvd.gif in IceBuddha though, I see there is a lot of data after the trailer. You can get the same data by right-clicking on the parse data in IceBuddha and selecting "Download parsed data". 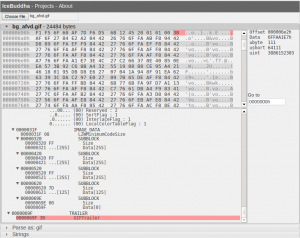 It then reads in the file, extracts the key, and decrypts the remainder of the file, which it writes to bg_afvd.gif.infected, This file has the md5sum 297ef5bf99b5e4fd413f3755ba6aad79 which you can search for in virustotal and the search result confirm this is indeed the correctly extracted MiniDuke file.